Editor's note: We're live blogging from the Supreme Court today as the nation waits to see how the justices will rule on the health care law. You can follow along below as CNN Supreme Court Producer Bill Mears and Senior Legal Analyst Jeffrey Toobin get the latest details live from the court as well as analysis when the opinion is delivered. Watch live coverage and analysis on CNN TV, CNN’s mobile apps and http://cnn.com/live. [Updated at 12:23 p.m. ET] President Obama touted the benefits of the law he championed as he reacted to the Supreme Court's ruling. "By this August, nearly 13 million of you will receive a rebate from your insurance company because it spent too much on things like administration and CEO bonuses and not enough on your healthcare,” Obama said. Other benefits include lower drug costs for seniors as well as denying insurers the option to deny coverage because of pre-existing conditions. It also provides free preventative care in certain cases and issues credits to those who can’t afford their health insurance premiums. Each state will decide its “own menu of options” and they're welcome to come up with ways to cover more people and improve costs, Obama said. The president said he respects concerns about the bill and he understands that people are worried that it was politically driven, but he said it should be clear by now he didn’t push for the act because it was “good politics." “I did it because I believed it was good for the American people,” he said. [Updated at 12:16 p.m. ET] President Barack Obama on Thursday called the Supreme Court's decision upholding his signature health care law "a victory for people all over this country whose lives will be more secure because of this law." "They’ve reaffirmed a fundamental principle, that here in America, the wealthiest nation on Earth, no illness or accident should lead to any family’s financial ruin,” Obama said. [Updated at 12:12 p.m. ET] Rep. Michelle Bachmann, R-Minnesota, responded to the ruling by saying, "This is a turning point in American history. We will never be the same again with this denial of liberty interests. But also it is a black cloud pragmatically speaking on economic recovery. There will be no hope of economic recovery between now and the election. We have exhausted now our legal solutions to be able to rid the nation of Obamacare. Now, we have to look for a political solution." [Updated at 11:57 a.m. ET] GOP presumptive presidential nominee Mitt Romney is speaking now regarding health care. “This is a time of choice for the American people. Our mission is clear: If we want to get rid of Obamacare, we have to replace President Obama,” he said. [Updated at 11:55 a.m. ET] Vicki Kennedy, the wife of late Sen. Edward Kennedy released the following statement regarding the health care ruling. work. The stakes are too high for us to do otherwise. As my late husband Senator Edward Kennedy said: 'What we face is above all a moral issue; that at stake are not just the details of policy, but fundamental principles of social justice and the character of our country.'" [Updated at 11:49 a.m. ET] The U.S. Conference of Catholic Bishops said it is for comprehensive healthcare reform, especially for the poor, but it opposes the Supreme Court decision for three reasons. "First, ACA allows use of federal funds to pay for elective abortions and for plans that cover such abortions, contradicting longstanding federal policy. The risk we identified in this area has already materialized, particularly in the initial approval by the Department of Health and Human Services (HHS) of “high risk” insurance pools that would have covered abortion. Third, ACA fails to treat immigrant workers and their families fairly. ACA leaves them worse off by not allowing them to purchase health coverage in the new exchanges created under the law, even if they use their own money. This undermines the Act’s stated goal of promoting access to basic life-affirming health care for everyone, especially for those most in need." [Updated at 11:37 a.m. ET] Lots of reaction from the political world on this decision, which was seen as an issue that could sway the upcoming election. But just as much as this is a political issue, the real impact is on everyday Americans. Here's a look at how some of those people reacted to the decision. [Updated at 11:30 a.m. ET] Senate Majority Leader Harry Reid gave his reaction to the ruling. "No longer will American families be a car accident or heart attack away from bankruptcy," Reid said. "Unfortunately Republicans in Congress continue to target the rights and benefits guaranteed under this law. They’d like to give the power back to the insurance companies, the power of life and death back to the insurance companies. But our supreme court has spoken. The matter is settled." [Updated at 11:24 a.m. ET] Al Sharpton, television host and president of the National Action Network, called the decision today a "breakthrough of sunshine in a long dark night of right-wing assaults on the American middle and working class." "After being bombarded with divisiveness and extremism politics it is refreshing that the courts took a step towards not interfering with the health care of American people that is sadly in jeopardy as clearly addressed by the President's Health Care Act," he added. "The ruling is a victory for people with cancer and their families nationwide, who for decades have been denied health coverage, charged far more than they can afford for lifesaving care and forced to spend their life savings on necessary treatment, simply because they have a pre-existing condition. The decision ensures that critical patient protections benefiting cancer patients and survivors will be implemented, such as those prohibiting insurance companies from denying coverage to people with a pre-existing condition, requiring insurers to provide consumers with easy-to-understand summaries about their coverage and requiring health plans in the individual market to offer essential benefits needed to prevent and treat a serious condition such as cancer. The ruling also preserves vital provisions that are already improving the ability of people with cancer and their families to access needed care by ensuring that proven preventive services such as mammograms and colonoscopies are offered at no cost to patients, eliminating arbitrary dollar limits on coverage that can suddenly terminate care and prohibiting insurance companies from unfairly revoking coverage when a person gets sick." [Updated at 11:20 a.m. ET] This major decision from the Supreme Court has a huge impact on a lot of people, in addition to being historically significant. To help understand it, take a look at our interactive which breaks down the decision. [Updated at 11:18 a.m. ET] Presumptive GOP Presidential nominee Mitt Romney will make a statement on the court's ruling at 11:45 a.m., according to his campaign. Ginsburg: law survivs largely unscathed. Seems right to me. Big winner at #scotus today is don verrilli, solicitor general. Among losers is me, who was so critical of of his oral argument. [Updated at 11:09 a.m. ET] President Barack Obama will deliver remarks in reaction to the ruling at 12:15 p.m. ET. [Updated at 11:06 a.m. ET] Reaction now coming in at a fast rate, in both statements, and tweets from those on both sides of this issue. Senate Republican Leader Mitch McConnell denounced the Supreme Court’s ruling, saying the Affordable Healthcare Act has limited choices and increased costs for American. McConnell, who has spearheaded Senate GOP efforts to repeal the bill and has delivered more than 110 speeches from the floor concerning the bill, said he promises to make a vote to repeal the healthcare law the primary business of the 2013 session if a GOP majority is voted into the Senate. Presently, the Senate is controlled by Democrats, while the House is controlled by Republicans. $8.2m in Anti Obamacare ads to air in 12 key states tmrw by Indep Conserv Group Americans for Prosperity. Biggest anti-health care ad buy. And senators on both sides are weighing in. [Updated at 10:59 a.m. ET] An Obama administration source says the White House really did not know what was going to happen. They are a bit surprised Roberts ruled to uphold but not Kennedy. The only word for it is elation, this person emphasizes. iReport: Did court make right decision? The expanded health care coverage upheld by the Supreme Court will allow patients to see their doctors earlier rather than waiting for treatment until they are sicker and care is more expensive. The decision upholds funding for important research on the effectiveness of drugs and treatments and protects expanded coverage for prevention and wellness care, which has already benefited about 54 million Americans. [Updated at 10:54 a.m. ET] House Speaker John Boehner renewed calls to reverse the Obama administration's signature health care overhaul after Thursday's Supreme Court decision upholding the act, saying the decision "underscores the urgency of repealing this harmful law in its entirety." [Updated at 10:52 a.m. ET] House minority leader Nancy Pelosi declared the court's ruling a "victory for the American people." "With this ruling, Americans will benefit from critical patient protections, lower costs for the middle class, more coverage for families, and greater accountability for the insurance industry," she said. Pelosi further said that the Affordable Healthcare Act will prevent children from being denied coverage for pre-existing conditions, lower drug costs for seniors and allow students and young adults to stay on their parents’ plan. “In passing health reform, we made history for our nation and progress for the American people," Pelosi said. "We completed the unfinished business of our society and strengthened the character of our country. We ensured health care would be a right for all, not a privilege for the few." [Updated at 10:50 a.m. ET] While the court found the Medicaid provision as it stands is unconstitutional, they said they think the government can make an easy fix to that problem, CNN Supreme Court Producer Bill Mears notes. “Confident that Congress would not have intended anything different we conclude that the rest of the act need not fall in light of our constitutional holding," Roberts wrote in the majority opinion. “Nurses experience the crisis our patients continue to endure every day. That’s the reason we will continue to work for reform that is universal, that doesn’t bankrupt families or leave patients in the often cruel hands of merciless insurance companies,” said NNU Co-president Karen Higgins. [Updated at 10:47 a.m. ET] “Today’s historic ruling by the nation’s highest court marks a significant milestone in our national efforts to improve the delivery and financing of health services in the U.S. and to promote health and wellness rather than disease treatment. The Supreme Court’s decision allows for long-overdue changes made possible by the law to move forward without question or further delay,” said American Public Health Association executive director Georges Benjamin. “It is reasonable to construe what Congress has done as increasing taxes on those who have a certain amount of income, but choose to go without insurance. Such legislation is within Congress’ power to tax." Saying the high court had set “the stakes for the November election,” Republican National Committee Chairman Reince Priebus said the only way to defeat what the RNC calls “Obamacare” is to elect a new president. Priebus describes the Affordable Healthcare Act as a “budget-busting government takeover” and says up to 20 million Americans could lose their employer-funded coverage as a result of the act. “A panel of unelected bureaucrats now has the unprecedented authority to come between elderly patients and their doctors. Meanwhile, the rules and regulations placed on job creators and small businesses make it nearly impossible to hire new workers at a time when Americans desperately need jobs,” Priebus wrote. The fight for #FullRepeal begins NOW. The way to get rid of #Obamacare is to defeat Obama in November. [Updated at 10:38 a.m. ET] Physicians for a National Health Program responded critically to the Supreme Court’s decision, saying that the ruling did not amount to universal coverage, 26 million people will remain uninsured, it keeps in place high co-pays and gaps in coverage and it will not control costs. “Why is this so? Because the ACA perpetuates a dominant role for the private insurance industry. Each year, that industry siphons off hundreds of billions of health care dollars for overhead, profit and the paperwork it demands from doctors and hospitals; it denies care in order to increase insurers’ bottom line; and it obstructs any serious effort to control costs,” the group’s statement said. [Updated at 10:31 a.m. ET] A senior administration official tells CNN that President Barack Obama will speak within a couple of hours. Victory for the American people! Millions of American families and children will have certainty of health care benefits + affordable care. Question: Can the court decide the constitutionality of health care now, or does it have to wait a few years? To answer, the court had to decide whether a penalty the law imposes on people who do not have health insurance amounts to a tax. A previously obscure law mandated that the legality of a tax cannot be challenged until it is imposed, and the health care law doesn't call for penalties until 2014. The court's answer: The court upheld the entire law. Question: Is the requirement that people have health insurance - the so-called individual mandate - constitutional? The court's answer: Chief Justice John Roberts wrote that the commerce clause did not apply, but the mandate stands under the taxing clause. Question: If the individual mandate is unconstitutional, can the rest of the law stand, or is the whole thing unconstitutional? The court's answer: The mandate is constitutional, rendering moot further questions on the rest of the law. Question: Can the federal government force states to expand their share of Medicaid costs and administration? The court's answer: Yes, but the justices ruled that the federal government cannot remove existing Medicaid funding if the states choose not to participate in the new program. [Updated at 10:26 a.m. ET] Because the individual mandate has been upheld, and is essentially the funding behind everything else, this can be seen in large part as a major victory for President Obama, CNN Supreme Court Producer Bill Mears said. Chief Justice John Roberts was the swing vote in the decision, Kate Bolduan reports, joining Ruth Bader Ginsburg, Stephen Breyer, Sonia Sotomayor and Elena Kagan. That judgment is up to the people, according to the ruling. [Updated at 10:19 a.m. ET] Even though there's disagreement on the issue, the majority ruling is essentially saying it is up to the branches to work out the differences. "When a court confronts an unconstitutional statue its endeavor must be to conserve, not destroy the legislation," Ginsburg wrote. The decision is 110 pages, including the dissent, which was written together by Justices Scalia, Kennedy, Thomas and Alito. A concurring opinion was written by Justice Ginsberg. Important to say that (obviously) this is a complicated ruling and Roberts' did say indiv. mandate could not stand under Commerce Clause. [Updated at 10:15 a.m. 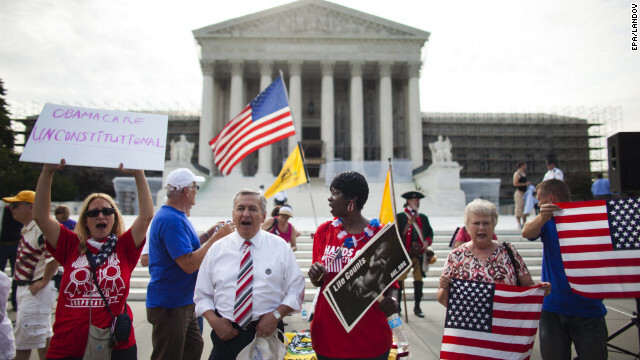 ET] The Supreme Court has upheld the entire health care law by a vote of 5 to 4, Supreme Court Producer Bill Mears said. That includes the medicare provision. "[Updated at 10:06 a.m. ET] In a landmark decision that will impact the nation for decades, the Supreme Court on Thursday upheld a key provision of President Barack Obama's health care law, ruling that requiring people to have health insurance violates the Constitution. [Updated at 10:00 a.m. ET] A federal law making it a crime to falsely claim military medals earned was struck down Thursday by the Supreme Court. The 6-3 ruling was a free speech victory but perhaps in name only - for a onetime California public official who publicly lied about winning the prestigious Medal of Honor. Opinion 1 is out. Court rules in favor of man who lied about receiving the medal of honor. Court says lies protected by 1st amendment. Some of the more colorful characters include belly dancers and a man dressed as a American Revolution-era patriot. The friction over the healthcare issue is on display as the crowd of hundreds makes their sentiments known, Todd said. [Updated at 9:55 a.m. ET] The five minute warning has gone off in the courtroom and the press room. That's a signal that the public session will begin in five minutes. Soon after that we'll get our first ruling. WHAT'S GOING TO HAPPEN: At 10 am, first will likely be two other rulings. Then healthcare verdict. Then @JeffreyToobin says something smart. [Updated at 9:54 a.m. ET] In addition to this live blog we'll be having full coverage on air, on CNN.com and on our mobile apps. As soon as the ruling comes down our experts will be breaking down what this means on air and in opinion pieces. And we'll likely also hear from many groups weighing in on the issue. [Updated at 9:47 a.m. ET] CNN Supreme Court Producer Bill Mears notes it has gotten eerily quiet inside the Supreme Court press room. Many, if not most, of the reporters have gone into the actual courtroom to hear the decision. We're now only minutes away from knowing the fate of the health care law in the US. Watch @CNN now. There are a lot more reporters than normal at the court today, Mears notes, given the likely historic nature of this decision. [Updated at 9:46 a.m. ET] Nobody will get a heads up on the decision, as is always the case. President Obama, his administration and Congress will all likely be watching TV just like everyone else to get the final word from the Supreme Court. [Updated at 9:40 a.m. ET] We don't yet precisely when President Obama may react to the court decision. It could be a while after the decision because it could take a while for officials to review the decision if it's convoluted. [Updated at 9:35 a.m. ET] Most of the reporters who want to hear the opinion being read from the bench have left to go into the courtroom. The general public is also being seated at this time. Before court begins the public and reporters will be given orders for how everyone should handle themselves when the rulings come down. CNN Supreme Court Producer Bill Mears said it is often solemn and many people are paying intense attention to the justices. Mears notes that there are lots of security measures in place to make sure no electronics are in the building and to try and look for any signs the general public may want to get in the court. Neither of those are allowed. [Updated at 9:35 a.m. ET] The court will also post the written opinions on their website within five minutes of when they announce it from the bench. [Updated at 9:31 a.m. ET] At this point, the opinions have been printed out, likely last night by the government printing office. They were brought over, likely this morning, to the clerk's office and kept under lock and key. At some point copies will be transported to the public information office, where they will remain until about 10 a.m. ET. At this point the clerks and justices know ruling. The rest of us are just waiting. CNN Supreme Court Producer Bill Mears notes that early votes were probably taken after oral arguments, but justices can change their mind, and nothing is set in stone until the full opinions are done and eventually read out. Many people are worried that there will be a majority opinion, but many different reasonings behind the opinion. A majority is nice, Mears said, but you hope the court will speak with one voice regarding what the Constitution has to say about the issue. It will be helpful for Congress, should they have to make any changes based on the ruling. It may take some time to figure out exactly what the court is saying and where it is going. [Updated at 9:29 a.m. ET] Despite the fact that we're awaiting a historic decision at the Supreme Court, the process here at the court is business as usual, Mears said. Reporters will wait to receive the box containing the Supreme Court opinions. Reporters will line up and grab a copy for themselves and start to break it down. We may be able to tell you right away whether the individual mandate itself was upheld or not, but there are a lot of questions the justices are looking at here. So it may take a bit of time before we get a full, clear idea of the court's entire ruling. We're waiting to see whether they will handle each issue one-by-one or now. – Does the law overstep federal authority, particularly with the "individual mandate" that requires nearly everyone to obtain health insurance or pay a penalty? – Must the entire Patient Protection and Affordable Care Act be scrapped if that key provision is unconstitutional? – Are the lawsuits brought by the states and other petitioners barred under the Anti-Injunction Act and must they wait until the law goes into effect? – Are states being "coerced" by the federal government to expand their share of Medicaid costs and administration, with the risk of losing that funding if they refuse? [Updated at 9:14 a.m. ET] In many ways the frenzy at the courtroom here has a similar feeling to Bush v. Gore, CNN Supreme Court Producer Bill Mears said. But it is even more heightened because for that case the court didn't say when they were going to issue the opinion and it ended up coming down at night. With health care, we know the ruling is coming down today and you can feel the drama in the air. Protesters, demonstrators and onlookers have taking that as an opportunity to come and view a part of history. There seems to be a greater intensity and electricity around the court since we know we will get this ruling in about an hour, Mears said. [Updated at 9:13 a.m. ET] Things will get going in the court at about 10 a.m. Here's how things will begin: The marshal of the court, Pamela Talkin will gavel the court to order, the audience will rise, the justices will enter from a big, red draped curtain. The Supreme Court justices stand in front of their seats and the marshal will recite an introduction: "Oyez! Oyez! Oyez! All persons having business before the Honorable, the Supreme Court of the United States, are admonished to draw near and give their attention, for the Court is now sitting. God save the United States and this Honorable Court." The gavel will bang and everyone will sit and Chief Justice John Roberts will take over. We expect health care will be the third and last opinion to be released, but we can't be sure of the order. The Chief Justice will introduce the justice reading the majority decision. That justice will read part of the opinion from the bench. The dissenting judges also have the chance to do the same. When all opinions are done, the court will recess for the summer. [Updated at 9:00 a.m. ET] We're about an hour from the big ruling and CNN's Supreme Court Producer Bill Mears notes it is a crazed atmosphere in the press room at the Supreme Court this morning. There's about three dozen live cameras outside and a dozen more other cameras around the building, Mears said. And there are about at least 100 people in line to hear the oral arguments but only 50 to 75 seats available. Not everybody who wants to witness history will get a chance today. [Posted at 7:00 a.m. ET] The Supreme Court will rule on Thursday on the constitutionality of the health care law and could issue as many as four separate opinions on it. The Patient Protection and Affordable Care Act (PPACA or ACA) was signed into law March 23, 2010, passed by a Democratic congressional majority and championed by President Barack Obama. It has about 2,700 pages and contains 450 some provisions. The high court begins releasing decisions at 10 a.m. ET, and we'll be live blogging throughout the morning bringing you updates from CNN Supreme Court Producer Bill Mears and CNN Senior Legal Analyst Jeffrey Toobin, among others, to break down the rulings and providing analysis and reaction. Thomas Jefferon warned us this day was coming. Well I guess it's here. Here are my recommendations. All conservatives need to go to the bank Monday morning and pull out all of your cash. Then call your broker and sell all of your stock. Then call your employer and refile your W4 with 30 exemptions to dry up the 941 deposits to the government. These steps will crash the monetary system and it won't matter to us because we will have our cash and we can leave the country. I am so glad that someone saw the need for medical care for Americans. It may not be perfect but it is a beginning. About all the complaining about forcing someone to purchase health insurance. We are already forced to purchase Home Owners insurance if we have a mortgage and if we want to drive an automobile we are forced to have liability. I look at it that if someone does not carry health insurance then we pay through OUR health insurance for them when they get sick. Give me a break people forget the politics and think out of the party box. The Affordable Care Act is now Law .Love or hate it the fact that real Americans are benefiting from the new Change ,Women gives them greater control over their health care,Eliminates Co-payment for preventative services,Ensures. basic preventative Services. Children and young adults will have greater access to quality care.Health plans can no longer deny coverage to children with pre-existing conditions. Women will not have to pay more than men for the same insurance polices.Women will not denied coverage because they are sick or have pre-existing conditions. The Affordable Care Act means better health care for women and with these changes reduce the cost of Health Care and Health Insurance. The Affordable Care Act means better health care for Women ,Children. Making health care insurance more Affordable is intent of this Law giving Americans more control over their health care .Making Individual health insurance more affordable is the intent of this new law. With Lower health Insurance cost,It allows Americans more access to Health Care. I beloved up to you'll obtain performed proper here. The caricature is attractive, your authored subject matter stylish. however, you command get got an nervousness over that you want be turning in the following. ill indisputably come further until now once more as exactly the same just about very often inside of case you shield this hike. Very great post. I just stumbled upon your blog and wished to mention that I have truly loved browsing your weblog posts. After all I will be subscribing on your rss feed and I'm hoping you write again soon!